The paradise on earth Kashmir has almost everything that nature can offer. One such breathtaking destination is Tosamaidan. An alpine meadow that has been under the army since 1964 ans is now open for the world to visit. After decades of being utilised by the army as an ordinance testing ground, the place is now open for tourists as the lease of the army expired in 2014. 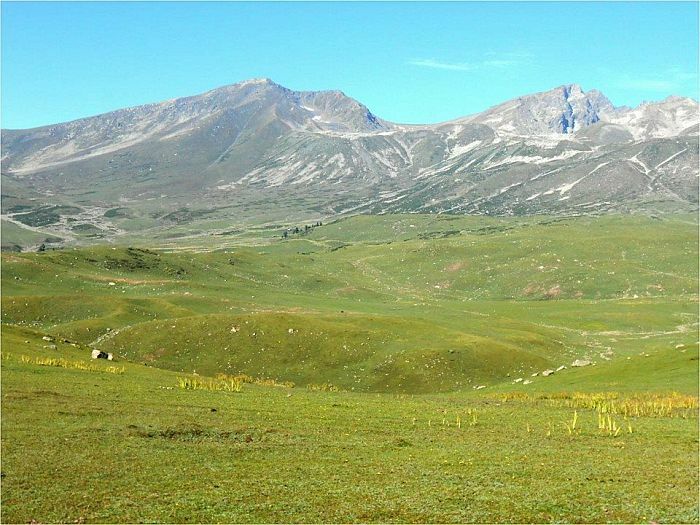 At an altitude of 3100m, Tosamaidan is the heart of the Pir Panjal ranges. A summer meadow it is frequented by shepards and herders with their flock of sheep and cattle. The peaks of Shin Mahinu and Shiv Nag in Tosamaidan offer majestic views. Tosamaidan is surrounded by gentle slopes and easy gradient that are referred to as "writing desk slopes". There are high altitude sparkling lakes like Damam sar and Bodh Sar which can be trekked to. Beyond Damam sar a trail leads towards the pass of Chini marg that goes towards Poonch via Jamian Da nallah. The cattle herders use this route. Tosa Maidan is a perfect spot for campers. You can camp at the base called Dam Dam. There are two possible ways you can move about in the place; you can either foot it or you can ride a horse. Tosa Maidan falls in district Budgam of Central Kashmir. One has to travel 45 km from Srinagar to Drung. This distance can be traversed by vehicle. From Drung afterwards, the path to Tosa Maidan is trekked on foot or on a horse. It is a distance of 10 to 15 kms. Tosamaidan can also be reached from Srinagar to Shunglipora via Magam, Beerwah at a distance of 52kms. Around the periphery of Tosamaidan there are lots of villages of historic importance like Khag, Drang, Poshkar, Khan sahib, Beerwah, magham etc. Best time to visit Tosa Maidan is from May to September. Tosa Maidan remains covered with snow from November till April.